Remove a rear wheel and take out the axle key so the wheel, reinstalled without fully tightening the axle nut, can turn on the axle. Hopefully you have a wheel puller, if not the wheel can be removed by removing the axle nut, turning the nut around backwards, screwing it back on, flush with the end of the axle, and whacking it with a heavy hammer. Do this with the wheel on the other side off the floor. One IMPORTANT thing, if you don't already know is NEVER NEVER jack up the rear of a model T with a jack under the center of the rear axle housing. 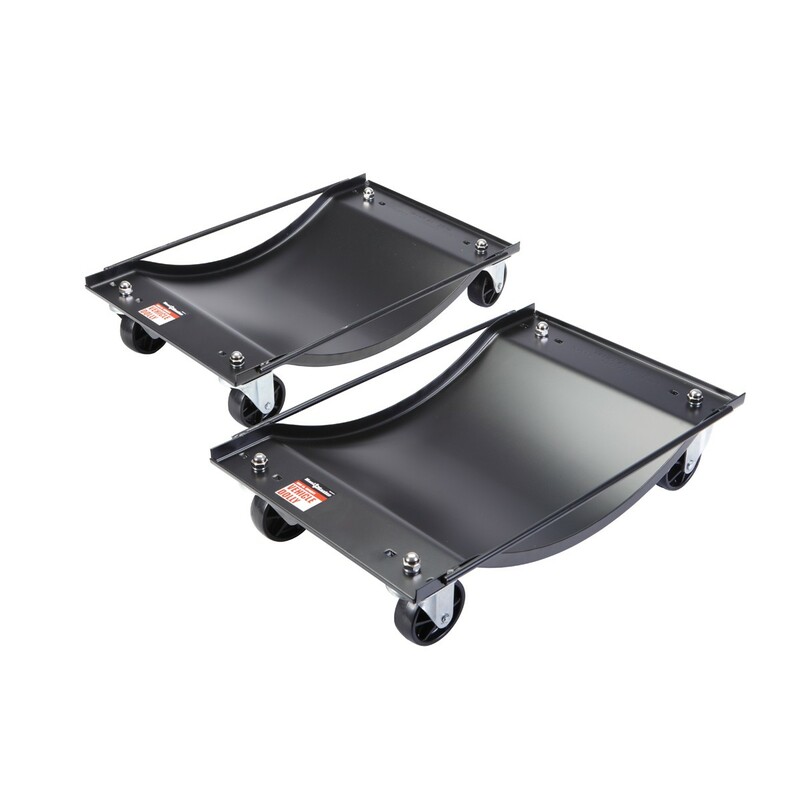 If you're just moving it in a building you can use this type of a car dolly to push it around. Also check to see if the starter bendix is not stuck or engaged. Try throwing the hand brake/clutch lever all the way forward and leaving it that way overnight. Then pull it back to the neutral position. By squeezing all the oil out of the clutch plates you might gain enough slippage to move the vehicle. Good luck! Take all of the spark plugs out of the engine, if the engine is not seized this should allow you to at least pull it up on a trailer to get it out of the storage space. then come back here with pictures and you will get plenty of help, and there are plenty of model T people in Ca. that can help reach out to them. Welcome to the affliction and where is Beaumont? G.R. Got it right. Just pull the plugs. Barring any serious mechanical problems, you should be able to push it around by hand and get it on a trailer. There is a chance the rear brake shoes are rusted to the rear drums, Beaumont is pretty humid in the summer. When the emergency brake lever is pulled back all the way, two things happen. The rear brakes are applied and the clutch in the transmission is disengaged. It�s hard for me to conceive of how the clutch could be sticking given that it runs in oil and is pretty well sealed from moisture along with the rest of the transmission. Try moving the emergency brake lever all the way forward to release the tension on the brake rods. Jack up a rear wheel and see if it will turn. 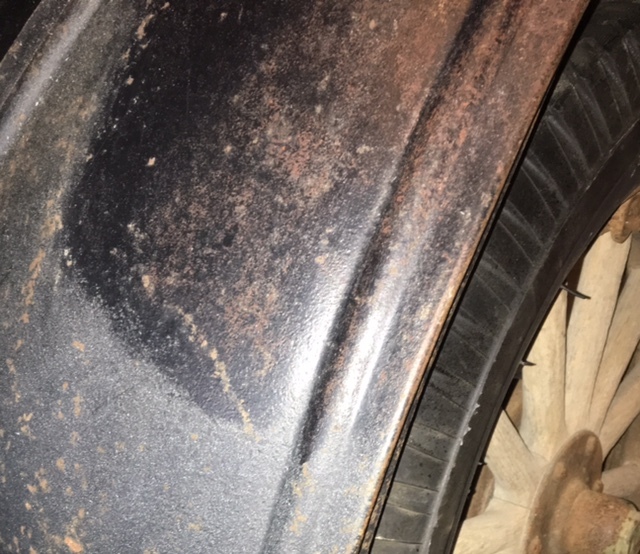 If the brake is rusted to the drum the wheel wont budge. If it is free there will be some play forward and backwards. If it will move a little jack up the other side and check that wheel. If it moves, the lockup is in the engine or transmission. If you determine the brakes are locked up, all you can do is drag it out. If you have to resort to that be sure you don�t attach the chain or tow strap to the front axle. Attach to the frame, ideally around the front crossmember where it rests on the front leaf spring. Take some good nylon rope and loop it several times loosely around the crossmember. Leaving it loose will allow room for a hook. Then start pulling. Mark -- Your profile page says you have a 1927 Truck. If it's a Ton Truck, you won't be able to roll it because of the worm-drive rear end gears. TT Myth. Worm gear rear end can be pushed, pulled, whatever, even by hand. Done it myself. Actually the T is in Wildomar, between Elsinore and Murrieta. Beaumont is in the Pass, between Riverside and Palm Springs. I'm gonna try the spark plug suggestions first and then I can move to rear wheels if needed. I need to pull it on a trailer, so the dollies won't work, but a great idea. I'll keep some of the other suggestions in mind also. Cool part about this is my brother found the original bill of sale from 1958 when my Dad bought it and we have the Pink slip and ignition key. Plan is to completely restore her since Dad never got around to it. I want to thank everyone for your help. Great community here. Mark, As you and your brother work on the truck, keep coming back here for advice. You will usually get several good ideas. The dollies will work on the rear wheels (if needed) to get it out of the garage/space and started on to the trailer, as the front wheels should still roll. When the dollies get to the trailer, take them out, drag the car onto the trailer just enough to get the dollies back under. Then go the rest of the way. Hopefully, the drums and shoes are NOT rusted into one piece and you'll be able to roll with the spark plugs removed. If the drums/shoes are rusted together, you might try tapping on the outside of the drums with a hammer to see if the bond will separate. I wouldn't get too crazy with the hammer, but you will have to get them separated in order to get the wheel off for repairs, if this is the problem. Good Luck, and be sure to let us know how things go. Mark, Dont jack it up by the pumpkin. Place your jack next to the wheel and do one at a time. If you make the mistake of pushing the low pedal to where the truck is in neutral,my TT will roll down a hill in a HURRY! Pulling the keys will be the easiest route if you can get the wheels off. Roll back truck can drag it if need be onto it's self. 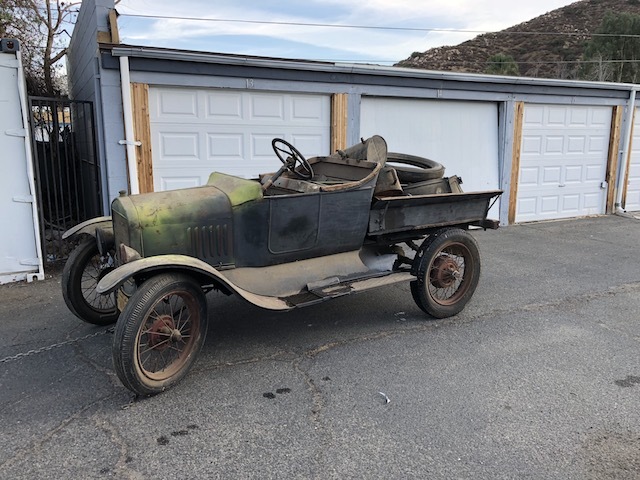 The car/pickup shown would not have a worm drive and it looks to be a 1924-25 runabout or touring converted into a pickup. Many people call a pickup a truck. Terry's suggestion sounds like a good one. Beautiful roadster body. On my 26, neutral is when the handle is when the handle is lined up with the dash. Any other location, she does not like to be pushed around. Thanks for the insight, Guys. I learned something. Well, I got her out of the storage. Took some nudging, but she rolled. The spark plug suggestion helped. I also disconnected the brake rod. It didn't seem to be the brakes, so I'm wondering if it's because it's been sitting for so long that the grease has dried up. The registration shows it to be a 1927. I can't read the ID plate, needs to be cleaned up and I'll confirm it. Again thanks for everyone that posted suggestions. This is going to be a new adventure for me and honor to restore it for my late father. Good news Mark. What a great truck. It will be a great project and to remember your father with. Its registered as 27 but It is earlier than that. Not uncommon in the T world. Check the number on the engine for year of engine and others with more knoledge here will help ID it. The wire wheels are 26-27. Here is the place for any questions you have and we like the photos. Merry Christmas to you. Great to see another T being brought back. Look at the differential (the fat part of the rear axle). If the drive tube from the engine goes into the middle of it, then it's a car's rear end. This is probably a Touring Car that was modified into a pickup truck. It was a common practice - the Touring was the least expensive and most abundant of the car bodies. If the drive tube goes to a "bump" on top of or underneath the differential, you have a Ton Truck, also known as a TT. That's a worm-gear setup, to give extra pulling power at the expense of top speed. It will also have heavier springs, etc. to make it able to carry a ton. At least you'll know for sure what you've got! I was wondering about the year! I thought all 26/27's had the gas tank in the cowl, but I wasn't sure. About the year, and the DMV: Model T's, unlike modern cars, do not have VIN numbers. The only number on a Model T is the Engine number, which is stamped into a flat place just above the water inlet from the radiator, on the Left side of the engine. If you have a water pump, it might obscure the number. 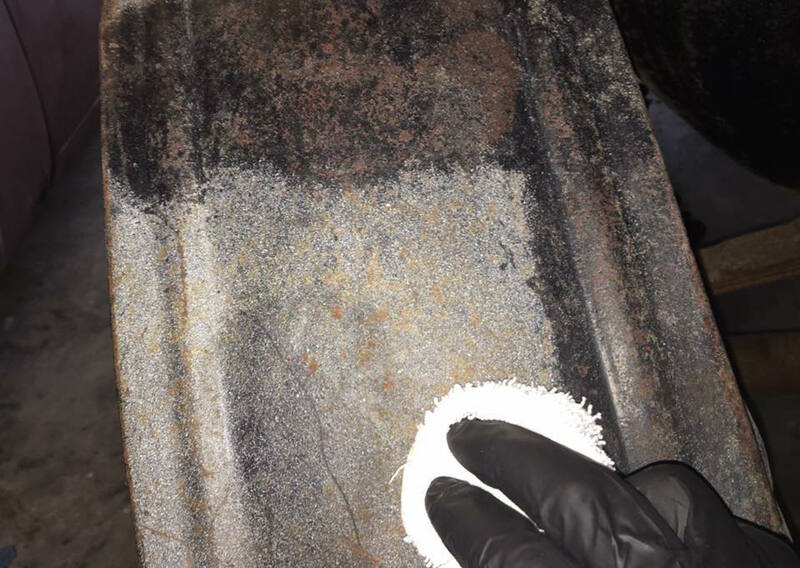 Often some scraping and sanding is required to get rid of rust and dirt and read the number. The number was stamped by hand, one digit at a time, so they are often not in a straight line. Be aware: The engine in your vehicle may not be original to the vehicle. But don't discuss this with the DMV. There is a place on the website where you can cross-reference the number you find, and it will tell you the date on which that engine was manufactured. Go with that as the determining factor as to the year of the car, as far as the DMV is concerned. Some bodies had numbers stamped in the area of the threshold of the right-hand door, some on the body and some on the frame. Don't muddy the waters trying to use that number (if there is one) to learn much about the car's origin. You could get waaaaay off into the weeds! I recently had to have a tow truck move my T with a locked up rear axle. Driver had a "skate". It looked like a wheel chock with a very long slope that he drove under the wheels which allowed the car to slide on the "skate". Appeared to be made out of some type of heavy nylon or Teflon material. Just my two bits worth, but if it were mine, I'd just get the mechanicals up in good shape and leave the body just like it is. You can always restore it later, but you can never un-restore it. Never. I've seen and heard of to many that have been torn down and never put back together. Get it running and drive it a little and then decide what you want to do with it. Also, if you go into a total restoration, you'll never even come close to getting your money back out of it if you decide to sell. I agree, it's a 1923 - 1925 Roadster Pickup. I think I see the rear fenders in the pickup bed. I wonder if the windshield is there also. Unless my eyes deceive me, it's not a touring cutoff. I echo what Fred says right above! A gentle cleaning to the body for now. Original is gone forever after sand-blasting etc. Unless you wish to see fresh paint. Look at those horizontal marks in the paint behind the false door. Scroll down just about half way for info on saving the finish. Blatantly stolen form Don's thread with Erik's input. Could a mild thinner remove the yellow over-spray/paint without disturbing the coating underneath??? Mark, I have one chance here at my place to reveal some original finish, perhaps hiding under the rust on a really crummy TT truck! Rubbing compound might do the trick under the zit-like rust. Get it running, repair/update the rear axle (or make sure it's updated/safe) and drive the wheels off of it! A great period pickup box to boot! A large drum rear axle? And the tires hold air... Really? What a gorgeous old pickup Mark! We wish for more pics when you have the time! Your eyes deceive you, Duey - follow the top belt line - goes to nowhere ! Runabout body doesn't have that feature. Hi Mark....I love your car. In my humble opinion, t'll make a great looking old girl with just a good cleanup and not a complete repaint...if that's the look you're after. My 24 Touring had some barn paint overspray on it and I removed it by spraying paint stripper on it, then removing it with a clean/dry rag after about 10 seconds. Under the white overspray was some really beautiful patinated, and probably original, black paint....the kind of stuff that only time and wear can create. If you use paint stripper, be careful not to get it anywhere else and use gloves. That stuff will give you a chemical burn in a jiffy. Try the crank first to see if the engine is free. 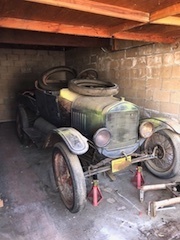 If the frame is a 1926 to match the wheels, there should be a number on the passenger side frame rail, about where the passenger would put a right foot on the flat floorboard. The number is not often stamped very deep and a wire brush cleanup may be needed to see it. The transmission cover will also have two ears on top to bolt the cover to the engine block for extra strength and avoiding a broken crankshaft on rough ground.